Actually, I’ll explain “Anyone Know” toward the end of this article. To provide the right context for it, I first need to cover the brand monitoring that’s already so well known. Comcast is the classic brand monitoring story, covered over and over again. Comcast watches for customer complaints on Twitter and responds back via Twitter. Great customer service. Got it. In fact, some people have gotten it so often that they’ll groan if Comcast gets trotted out as an example about the power of Twitter. wow @dominos if you were bad before heaven help those people in the past. took chance tried you tonight. awful. Nice outreach, and easy for Domino’s to do. I called them out specifically using their Twitter handle of @dominos, so all they had to do was monitor replies to them. Likely, they also run a standing search for any mention of “dominos” or “domino’s” to catch people who might complain about them without using their actual Twitter account name. The situation above is one-to-one search marketing, something that we pretty much haven’t had until the arrival of Twitter search. It’s a major reversal of the “search broadcast” system that we’re used to at places like Google. That’s a search on Google for pizza, with the “natural” or editorial listings showing on the left and the ad listings on right. With my Twitter example above, Domino’s found one person via search (me) with a problem and reached out to me directly, hence my “one-to-one” search marketing definition. Are people getting beyond brands and reaching out on generic terms? That would be a killer strategy. It would allows marketers to find people with particular needs, just as people turn to Google with needs, but it would also allow for reaching out to these people personally. 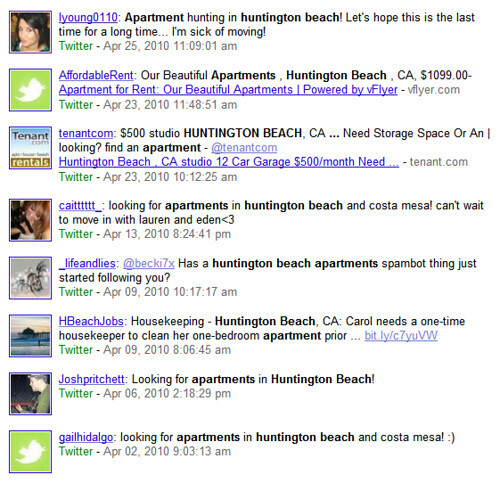 In those search results, you can see that several people are talking about actively seeking apartments. If you rented apartments in the city of Huntington Beach, reaching out to these people with a specific offer or invitation to view your rental — done right — would be a helpful, powerful marketing tactic. It’s also NOT brand monitoring. It’s watching for generic terms, which in the “regular” search world are the Holy Grail that search marketers seek. It’s easy for Domino’s or another brand to rank for their own name. It’s a harder challenge to rank for a generic term, for the generic product they sell — especially if you’re not a well known company. That’s seven different tweets in less than a minute all mentioning “pizza.” In an hour, you might be reviewing 500 or more tweets. Many of them will having nothing to do with places to get pizza, such as the person above missing her days of school pizza parties or two other people talking about making pizza. How do you find the signal from this noise? Now it’s time to meet the “Anyone Know” search. You can see the many calls for help being put out, often several or more within the space of a minute. Just as people “broadcast” their desires by doing searches on Google, so they are broadcasting their need for help on Twitter, if you search for the right terms to locate questions. “Anyone know” is just one example of that type of question-related term (can anyone tell me is another example). That’s a nice selection of people who didn’t call out to Domino’s by name but who Domino’s might be able to help. One person wants “legit” pizza — offer them a coupon! Another person wants good pizza places in LA — send them a link to your store locator. Another wants a discount for good grades from a rival chain. Come up with something similar to entice them. This type of outreach has to be done right. No one wants reply spam. Moreover, people following the main Domino’s account may not want a steady stream of outreach messages to individuals like this. Domino’s might need to maintain a separate account, perhaps something like “DominosAnswers” that would respond to these types of things. Perhaps many people are already doing this type of outreach on generic terms, and I’ve just missed the stories. Perhaps. However, I suspect most search marketing involving Twitter remains focused on brand-oriented searches. If so, I also suspect that will change. To me, the ability to reach out to an individual via search and answer their question is a revolutionary addition to the usual search marketing. To understand it even more, I’d encourage you to read my article from last week, The Twitter Search Revolution. That article goes into great detail about the one-to-one reversal I’ve described and the “search broadcast” concept in general. It also covers how, thanks to a growing emphasis on relevancy, Twitter search might soon provide both one-to-one and many-to-many search marketing options.